Blondie and Brownie: Happy Book Birthday to Us! Come ask us your burning questions about lunchtime adventures in midtown and pick up a copy of our book. Our come say hello at the Street Vendor Project's Great Street Meet tonight, where will raise a glass and/or doughnut to celebrate the Street Vendor Project's historic victory in the lower the fines campaign. Can't make today's event? We have a number of other events scheduled around the city including a signing at the Rock Center Posman Books on Wednesday, 4/10 at 1pm and more in the works. 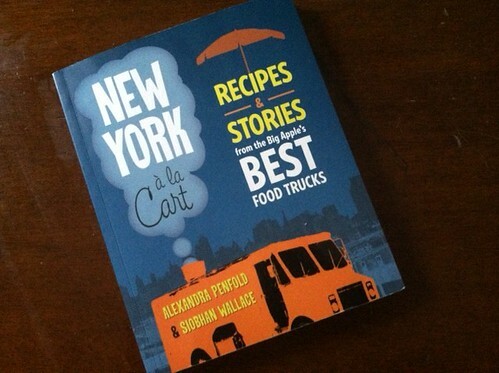 Of course on our book's pub date, we'd be remiss not to say a HUGE thank you to all the hands that went into making New York à la Cart. So many terrific people came together to make this book possible. Here just a short list of the many, many people that we have to thank and thank again: first and foremost the wonderful vendors who inspire us daily with their hard work, the fine folks at our publisher, Running Press, our fabulous agent, Susan, our amazing photographers Donny and Clay, our lunchtime guru, Zach Brooks who wrote the foreword, the terrific team at the Street Vendor Project and last but certainly not least, our families and friends who supported us through all the research, writing and recipe testing and helped our in countless ways. We couldn't have made it without you! Thank you! Thank you! Thank you! Stay up-to-date with all the latest eats and tweets via @blondiebrownie.